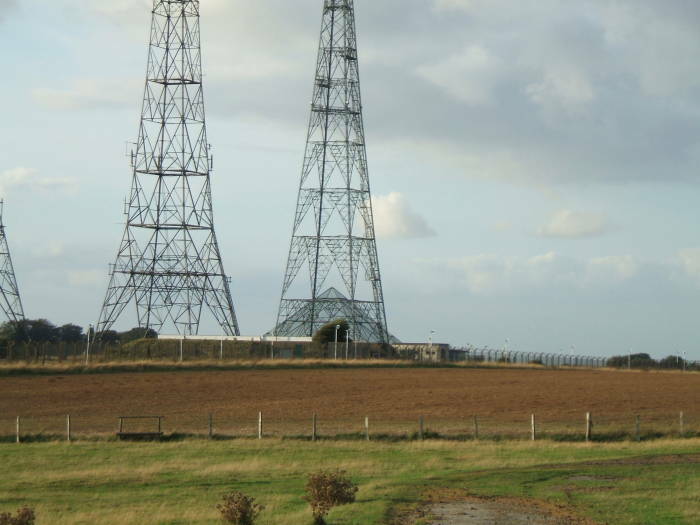 The Swingate Chain Home radar station was built in the late 1930s and used heavily during World War II. 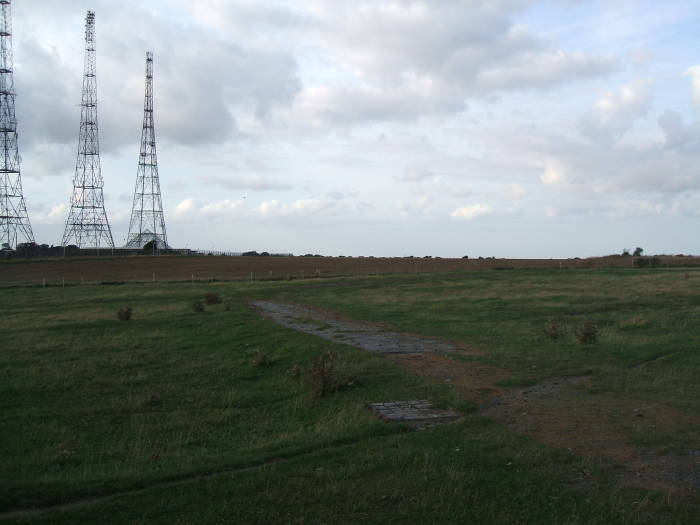 It was part of the Chain Home network of early warning radar systems built by the British before and during the Second World War. It was one of the very first practical radar systems, and played a vital role in the defense of Britain against Nazi Germany's Luftwaffe. Elements of the Chain Home network remained in service through 1955. On 11 July 1934 the New York Times published an article in which Nikola Tesla claimed to have invented a death ray. The headline read "TESLA, AT 78, BARES NEW 'DEATH BEAM'". He wrote that his invention "will send concentrated beams of particles through the free air, of such tremendous energy that they will bring down a fleet of 10,000 enemy airplanes at a distance of 250 miles" and that it would make war impossible by offering every country a perfect shield. By 1937 it had become obvious that war would soon break out in Europe. Tesla wrote a paper titled "New Art of Projecting Concentrated Non-Dispersive Energy Through Natural Media" providing a technical description of his charged particle beam weapon, and sent copies to allied countries including the U.S., Canada, the U.K., France, the U.S.S.R., and his home country of Yugoslavia. Tesla's original New York Times article had led to a number of parallel claims and interest by several governments, but nothing had come of it. Britain had asked scientists to look into it, but there was no sign of any practical system. Some of those scientists began looking into methods of detecting and locating aircraft by reflected radio signals. So if you double the range, the received signal drops by a factor of 16. At ten times the range, the received signal drops by a factor of 10,000. Not much comes back! Path loss and scattering similarly work against you in both directions. As for the radar cross-section, the measure of the reflection of the signal from the target, the dimensions of military aircraft meant that signals with wavelengths around six meters might be a good choice. In the interest of building a system that was "good enough" rather than an indefinite wait for an optimal system, they used components of commercial transmitting units operating at the upper end of the 12-meter band at 22–25 MHz. 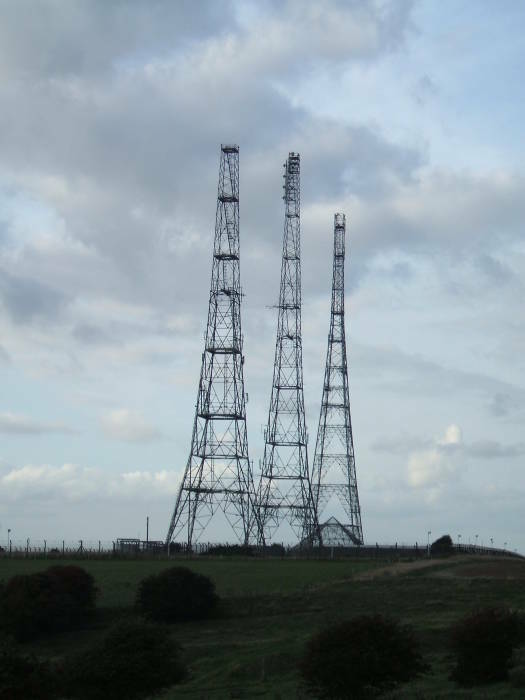 These had been designed for the BBC transmitting site at Rugby. The first five radar stations were commissioned in 1936. By the beginning of the war in September 1939 there were 21 operational stations in what had been named the Chain Home system. By one year later it extended from Orkney in the north to the southern coast. 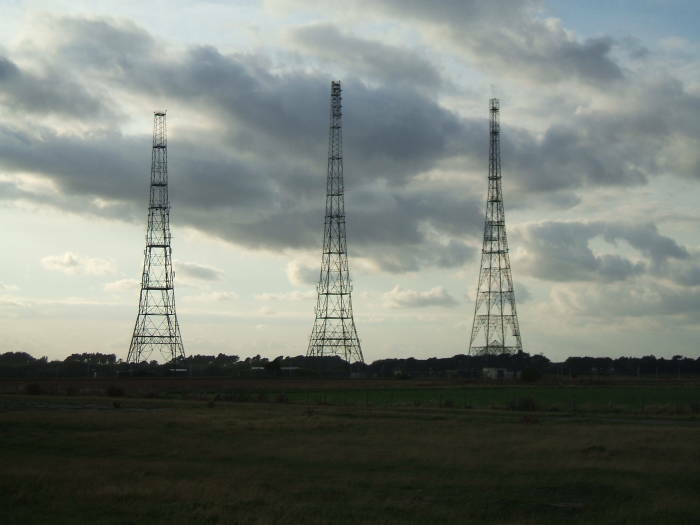 Increases in transmit power to 750 kW provided detection of high-flying aircraft over France. Radar coverage: dotted line shows main cover at 15,000 feet in September, 1939. Solid line shows increase in main cover in September, 1940. Each Chain Home site included separate transmit and receive systems a few hundred meters away, making it a very close-spaced bistatic radar system. 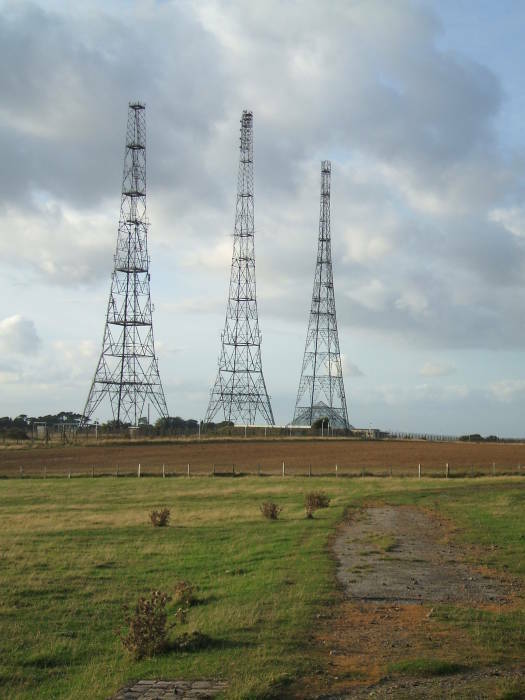 The transmitting antenna was a curtain array based on a row of four 110-meter metal towers about 55 meters apart. Three phased arrays were suspended between adjacent tower pairs. Each array had eight horizontal half-wave dipoles spaced λ/2 apart, with slightly longer reflective wire elements 0.18λ behind. This yielded a beamwidth of about 100°. The receiving system used an Adcock antenna array, four vertical antennas arranged in a square. 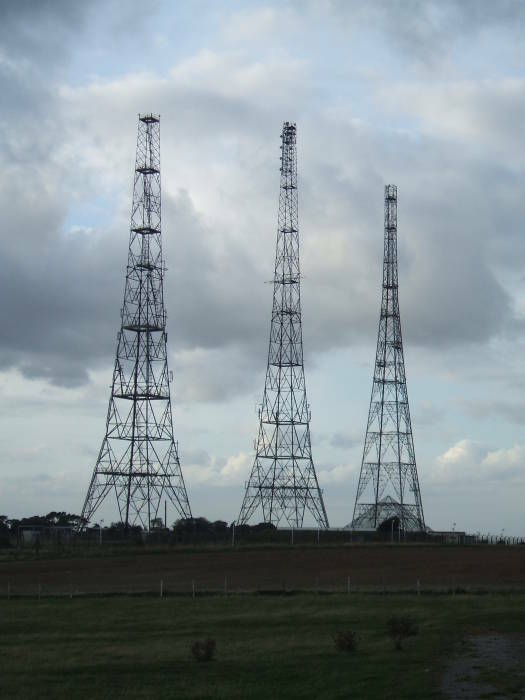 These were built with four 73-meter wooden towers, each with receiving antennas at 14, 29, and 65 meters above the ground. Range was measured by time delay of the echo, azimuth by using the Adcock array as a goniometer and tuning for maximum received signal strength. Elevation measurement was even more difficult, relying on the target's passage through the multiple lobes of the transmitting antenna pattern. 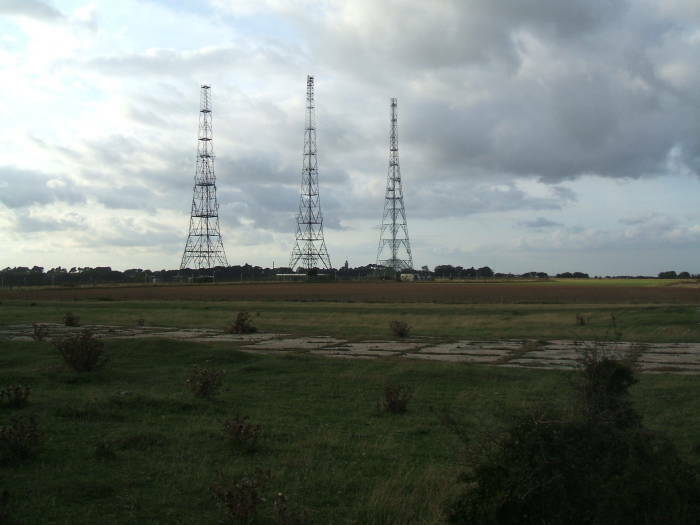 The tower at BAE Systems at Great Baddow in Essex, which originally stood at Canewdown, is said to be the only Chain Home tower still in its original, unmodified form. 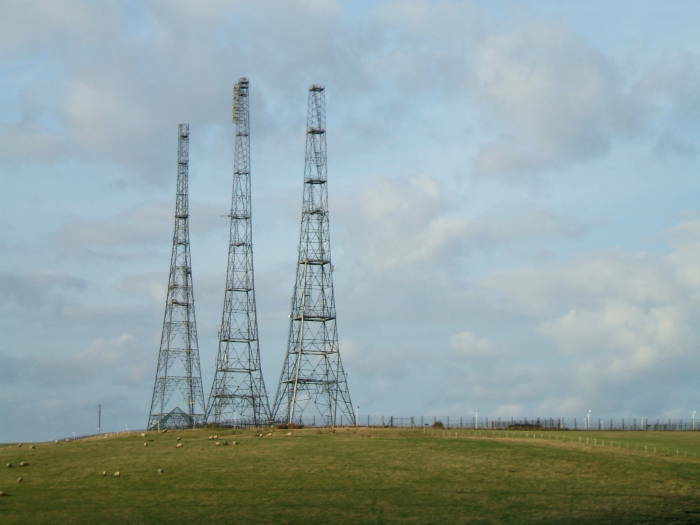 Only three of the transmitting towers remained at Swingate when I visited, and by 2010 one of those was gone. They had been modified to remove the cross-beams holding the dipole and reflector arrays, and were used to hold microwave relay systems. 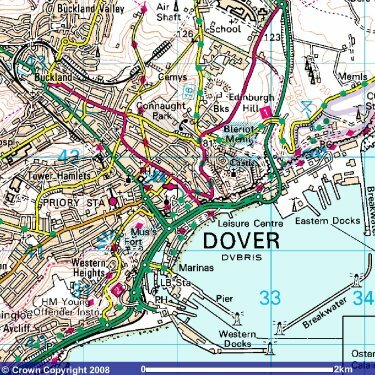 The data from the Chain Home network and others was collected in a facility in tunnels carved into the White Cliffs overlooking the Dover Harbor. Abandoned tunnels first excavated in the cliffs during the Napoleanic Wars were converted into a naval facility starting in 1939, and they were further extended following the fall of France in 1940. 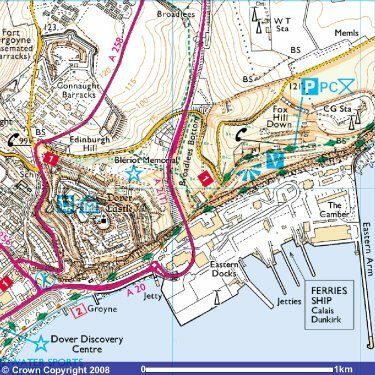 That naval facility became the new Combined Operations Headquarters for the Royal Navy, Royal Air Force and the Army, jointly charged with protecting the Straits of Dover and the coast of Kent. Sensor data including radar was collected, organized, and analyzed, and commands for intercept fighter missions and artillery fire were then issued. See my other page for more details and pictures of that facility, now partially open to the public. The Swingate station is adjacent to the World War I Swingate airfield. 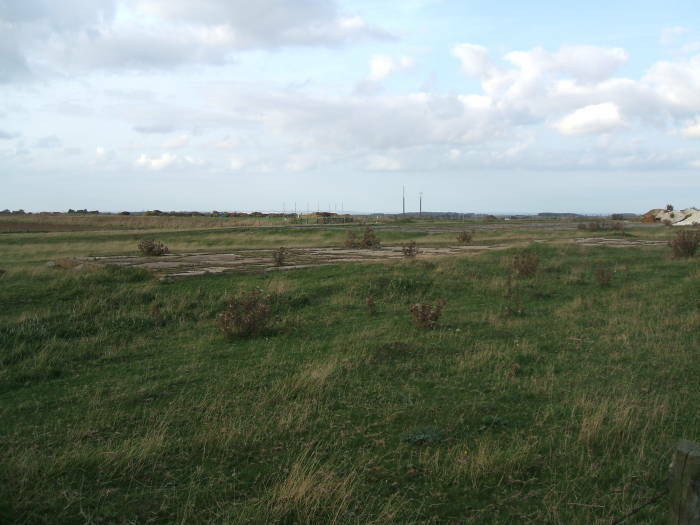 The airfield was used after World War II and throughout the Cold War as a Royal Observer Corps (ROC) base, a hardened facility to monitor and locate nuclear detonations. The ROC was formed in 1925 and lasted through the end of 1995. It was staffed mainly by civilian spare-time volunteers who wore a Royal Air Force style uniform and who eventually came under the administrative control of RAF Strike Command and operational control of the Home Office. World War II radar systems included the following. The Chain Home system operated at relatively low frequency, in the high HF through low VHF range. It ran relatively high power. The Chain Home Low and Extra Low systems used higher frequencies with the main lobes of their antenna patterns closer to the horizon. This reduced range but allowed detection of aircraft flying as low as 500 feet (Chain Home Low) and even 50 feet (Chain Home Extra Low). All anti-aircraft radars were also used for searchlight control, except for Giant Würzburg and SCR-584. Giant Würzburg was also used for night fighter control. From IEEE Spectrum, Aug 1987, referencing "The History of U.S. Electronic Warfare" by Alfred Price for German and Japanese systems; the Historical Electronics Museum and "Radar: A Reluctant Miracle" by John B McKinney for U.S. systems; and "Technical History of the Beginnings of Radar" by S.S. Swords for the U.K. See my other page for pictures from my visit to the Historical Electronics Museum. Atomic Weapons Detection Recognition and Estimation of Yield or AWDREY, to detect nuclear explosions and indicate the estimated size in megatons by measuring the level of electro-magnetic pulse. Bomb Power Indicator or BPI, to measure the pressure wave from a nuclear explosion passing over the post with a peak overpressure gauge. Ground Zero Indicator or GZI or shadowgraph, to measure the azimuth and elevation of the burst using an array of pinhole cameras within a metal drum. A variety of ionizing radiation detectors. Communication links were buried landlines. 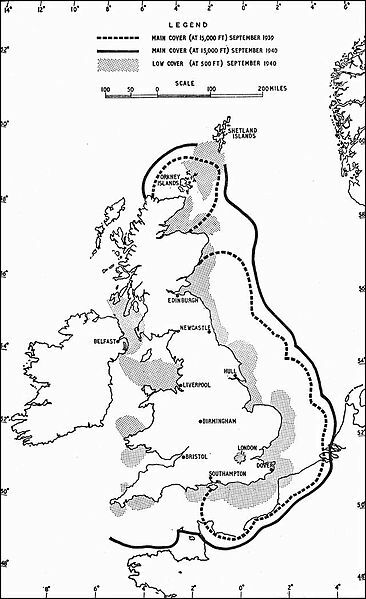 For more on the ROC see the Subterranea Britannica web site and the Wikipedia article on the Royal Observer Corps. Below at left: 1:50,000, and at right, 1:25,000 maps. The castle is immediately north and overlooking the center of the harbor. 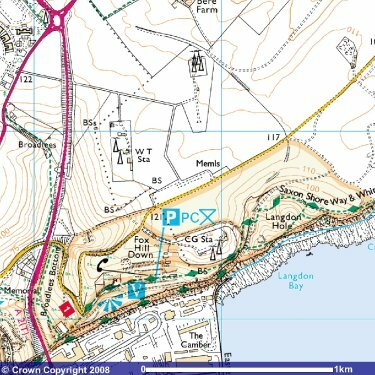 If you arrive by train, see Priory Station in the 1:50,000 map. 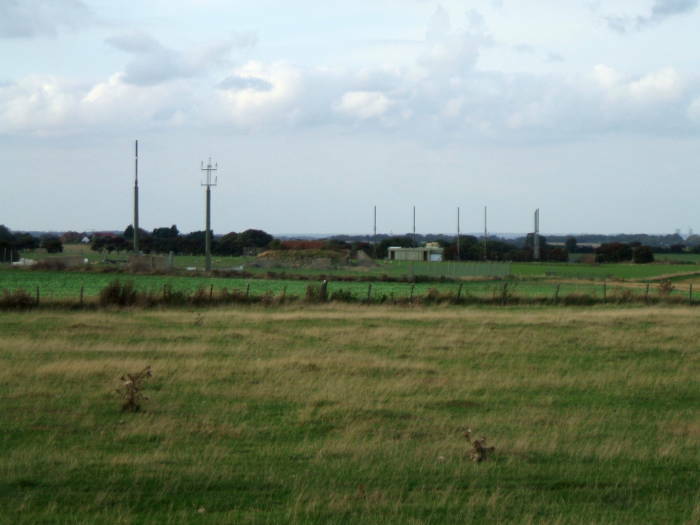 The Swingate Chain Home radar site is shown as two or three radio masts to the north-east of the castle. It's marked on the 1:25,000 map as "W T Sta" for "Wireless Telegraphy Station". "C G Sta", or "Coast Guard Station", is a relatively smaller facility near the edge of the cliffs. A cluster of smaller antennas is 500 to 600 meters to the north-east of the prominent site, almost due north of the Coast Guard station. 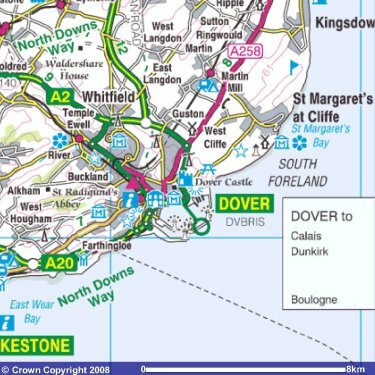 There are some great hikes along the White Cliffs in either direction out of Dover. This is along the White Cliffs Path, along the 16.6 km segment from Walmer to Dover. The White Cliffs are up to 110 meters tall. They're made up of soft, white, very fine-grained chalk formed mainly from the calcium carbonate from coccolithophores, single-celled planktonic algae. Their remains sank to the bottom of the sea during the Cretaceous period, 145-66 million years ago. There are some streaks of black flint within the chalk. 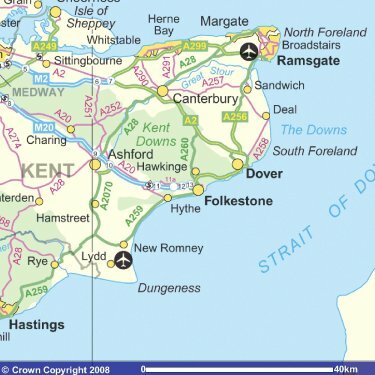 The chalk was part of a land bridge joining what is now southeastern Britain to northern France. 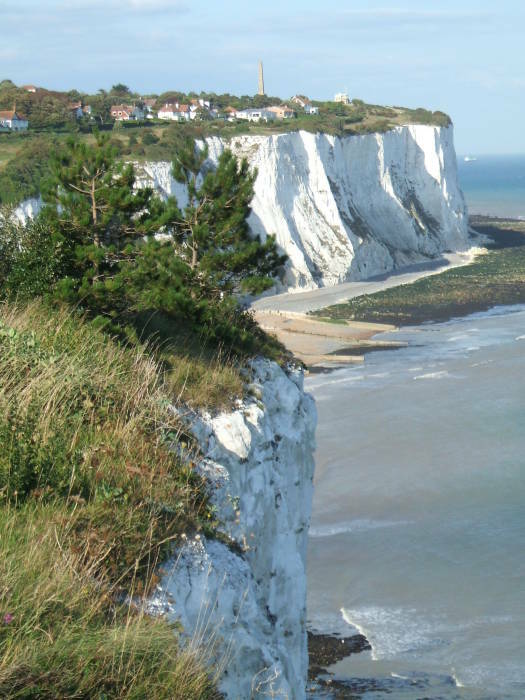 Two major floods, about 425,000 and 225,000 years ago, cut through the chalk and started the formation of what the English call the Strait of Dover within the English Channel, and the French call Pas de Calais within la Manche. The chalk is soft, and erodes at a rate of about one centimeter per year on average. That's the overall average, large chunks collapse from time to time. Don't get too close to the edge! 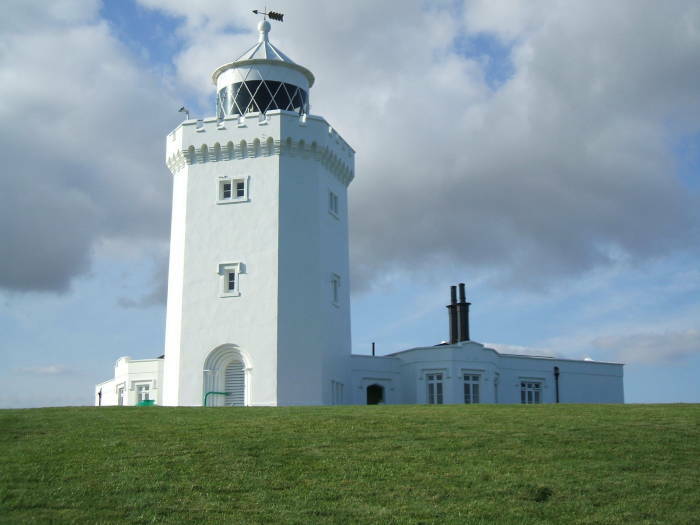 South Foreland lighthouse is near the edge of the cliff, overlooking some Second World War observation posts. Here I am approaching the Chain Home station from the south-west. 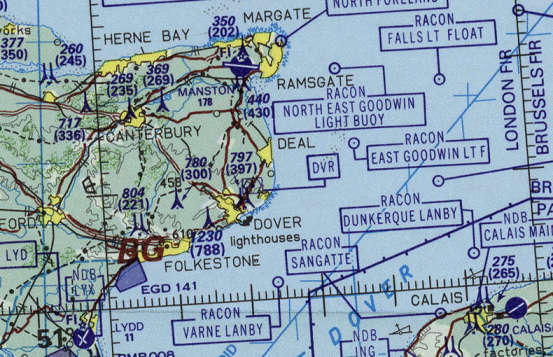 The station is located approximately at UK Grid location TR 334 428 and is clearly shown on Ordnance Survey maps. In places you can see remains of the WWI airbase with some fragments of asphalt runways still surviving. 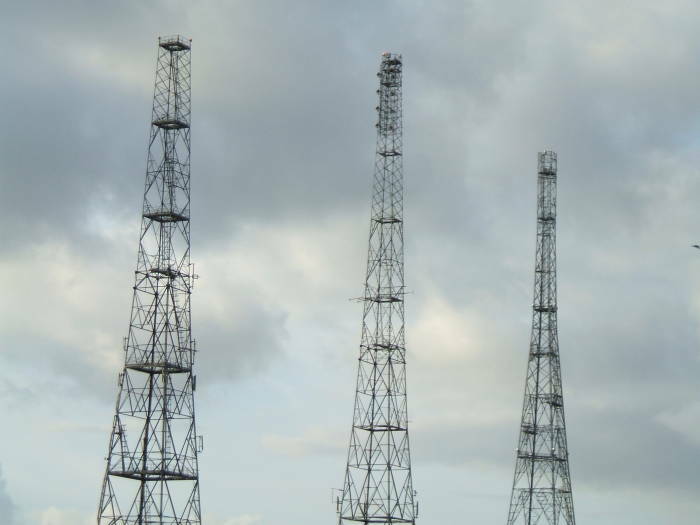 These towers are still in use holding some microwave links. 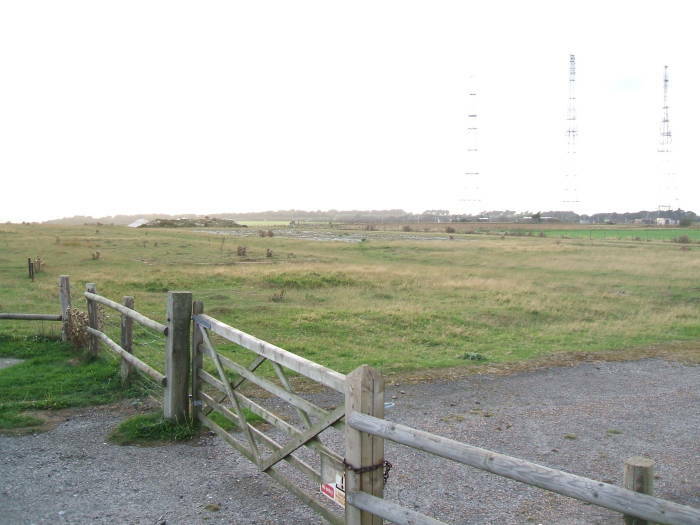 Looking across the former airfield, I think that the ROC nuclear watch facility was in the bunkers at right in the distance. We're looking across the former airfield toward the assumed ROC facility. Notice the remaining concrete in the pictures above and below. Here is the facility that I think is the former ROC nuclear watch station. The ROC sites were largely in use until the early 1990s.